Recently, I’ve been having network connectivity issues at home. Browsing the internet is generally fine, but if I try to stream a video or play games online, I have disruptions every few minutes. One of the suggestions that I got from Comcast was that there might be interference on the wireless channel that my router is using. I’m not wireless pro, but that seemed like a reasonable thing to check out. Before arbitrarily picking a different channel, I wanted to see what other wireless networks around me were using. After a quick or search or two, I found a free wireless analyzer called Meraki WiFi Stumbler. 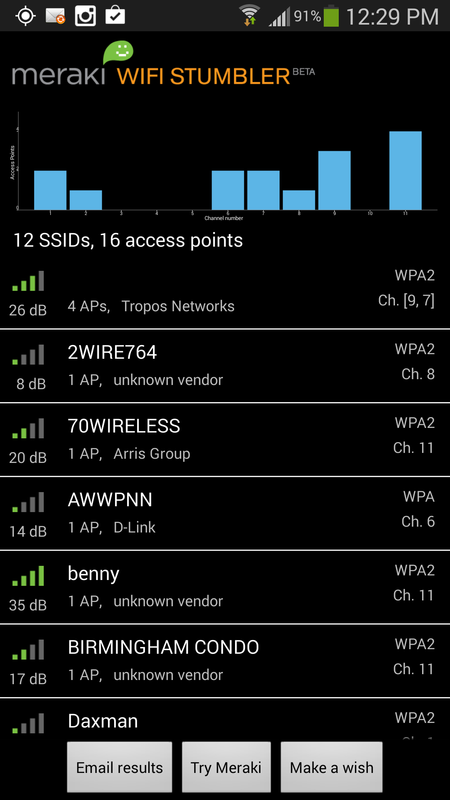 WiFi Stumber is a simple app that gives you basic details about the wireless networks that can be found. It’s easy to see the signal strength, encryption, and–what I was looking for–channel. Using the app, I did a quick scan to determine a channel that wasn’t being used by one of my neighbors and plugged it into my router. Now I can check wireless interference off my list of possible culprits!